Since the Apollo moon missions of the ’60s, only a few more than 500 astronauts have reached the hallowed height of 100 kilometers (62 miles) into space. But with the advent of commercial space tourism by Virgin Galactic this year, many more people—and nonastronauts—will be able to experience Earth from above. Blue Origin, an aerospace manufacturer and spaceflight-services company started by Amazon founder Jeff Bezos, is also expected to start selling tickets for space trips within the year. An expensive ticket will buy the view from space, but even then, the experience of zero gravity lasts only a few minutes. Will the time come when everybody gets to experience weightlessness for long hours and with no training? In Japan, researchers are working on a “space elevator” to make this happen in a way that minimizes cost and environmental impact, unlike traditional rockets that consume massive amounts of fuel. The space elevator is an electric vehicle called a “climber” that drives up and down one thin tether between the ground and a satellite in stationary orbit, using another outside tether for balancing with centrifugal force. The total length of the tether extends to 100,000 kilometers (62,137 miles). Before 1991, a material strong enough for the tether’s construction didn’t exist outside of science fiction—until physicist Dr. Sumio Iijima discovered the mechanism of the carbon nanotube, a material light enough and with the theoretical strength to realize the tether. 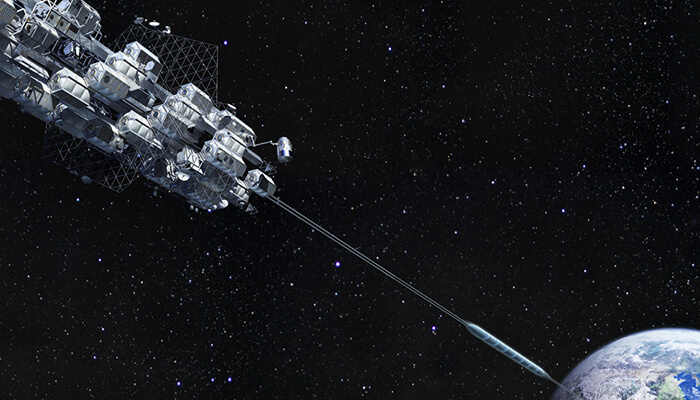 In 2012, Obayashi Corporation announced its Space Elevator Construction Plan, connecting Earth and space by 2050. To inspire young scientists and promote the space-elevator concept, a competition called EUSPEC (European Space Elevator Challenge) took place at the Technical University of Munich in Germany in 2011, 2012, 2016, and 2018. Team Raptor, a team from Nihon University that has participated in all four competitions, consists of Kaishu Koike and Naoki Arakawa. 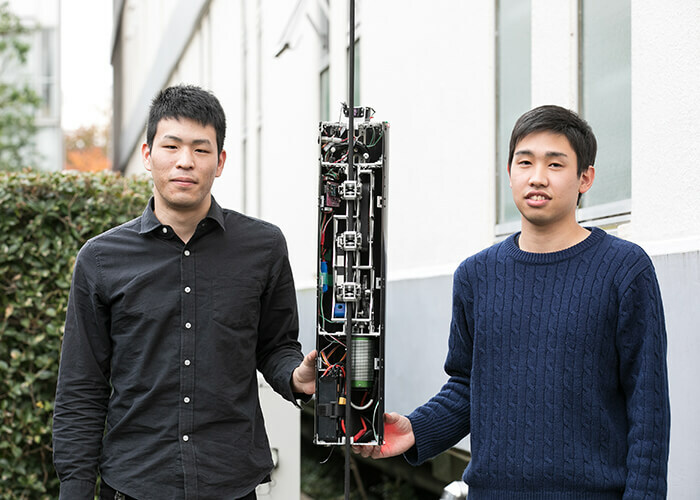 They’re both fourth-year university students and members of the Aoki Laboratory, led by Yoshio Aoki—a professor in Nihon’s Department of Precision Machinery Engineering, College of Science and Technology. The team has been working on strength calculations, durability, and the safety of building mechanical structures, as well as proactively promoting space-elevator research. In the 2018 challenge, Team Raptor achieved overall victory in the Advanced Class and received category awards in Safety, Construction Quality, and Innovation. 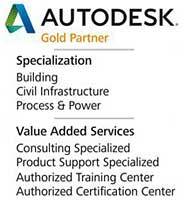 Each team developed a climber evaluated for speed, efficiency, and accuracy. The key to maintaining speed with the maximum eight payloads of 1.1 kilograms (2.42 pounds) each was to keep the weight of the climber itself as light as possible, using three-axis CNC for the machining. “By using the honeycomb approach, the main frame was hollowed out as much as possible, and we lightened the weight about 60 percent while also maintaining sufficient rigidity and good appearance,” Koike says. There were four metrics for this competition: number of payloads, speed, accurately ascending to a predetermined height (as well as descending safely), and using as little energy as possible. “The airframes were only halfway complete, and coming up with a design that would satisfy all the above points was quite difficult,” Aoki says. The team “designed the Raptor at a pretty fast pace while conducting simulations at the same time,” Aoki says. It achieved the maximum speed of 110 kilometers (68 miles) per hour, and even when the maximum weight was used, the Raptor maintained speed and an effective braking mechanism. “Above all, I think accomplishing the difficult task of stopping at exactly 100 meters [328 feet] with the control technology was really something,” he says. When Team Raptor conducted its operation test, the speed-reduction ratio wasn’t enough with the first design, and it wouldn’t be possible to elevate eight payloads. The team made changes just before the competition, retrimming the frame and remaking the gear. 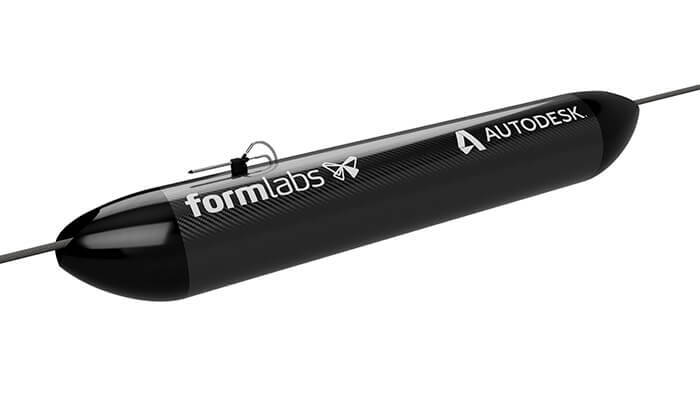 The design and CAM were combined with Autodesk Fusion 360; when shape changes were made on the model, the team quickly trimmed a new part, saving time. The Science Council of Japan is proposing a “hybrid space elevator” approach, which means simultaneously developing a concept that would be built from the ground and one to be constructed in space. The Department of Precision Machinery Engineering is going forward with the development of the climber on the ground and also aiding the research for a space-elevator construction in outer space. Additionally, a joint-development project between Shizuoka University and Obayashi Corporation called STARS-Me (Space Tethered Autonomous Robotics Satellite-Mini elevator) involves moving a small climber on a tether that links two CubeSats (small satellites). The Aoki Laboratory is taking on the tether-deployment mechanism and climber design development. Graphical depiction of Obayashi Corporation’s newly designed space-elevator system to be built by 2050. Courtesy Obayashi Corporation. Because this is uncharted territory, there are issues besides the technology surrounding the space elevator that need to be resolved prior to launch—which could happen in the not-too-distant future.